We had a wonderful day today, lovely weather, beautiful surroundings, and, you will be glad to hear, parents, very well-behaved children! We had fun in the adventure playground, newly renovated, then a picnic lunch, followed by a visit to the gift shop, and culminating in pond dipping in Mirror Lake. A great day! Mrs Hollings welcomes us to her beautiful garden. On the wild flower trail through the garden. Willow Class staged their Fairytales assembly on the last day of Term 5, which was also our Fairytales dressing up and baking fairy cakes day. For those of you who were unable to attend, or who would like a memory, here are some photos from the day. Cara made a beautiful Snow White! The Seven Dwarves try to awaken her. Oliver and Zara were the narrators. The woodcutter, stepmother and stepsister. Mary meets the Little Men. Willow children start their tour of the farm. Walking through the orchard, identifying trees. A great finish to the day: trailer ride! Last Thursday February 26th, we went to see a rip roaring performance by Dinosaur Zoo, in which we were introduced to some Australian dinosaurs! The compère assured us at the beginning that these were all puppets, and we had nothing to fear, but our experience was certainly hair-raising! But were Willow afraid? Some children shrank back in their seats, but no one hid under them, and two intrepid adventurers volunteered to go on stage with the compère, one of them even putting his head in the dinosaur's jaws! The other boy helped pacify the dinosaur while the monster had a tooth extracted... Well done, Oliver and Phillip! The final dinosaur was a gentle giant, a brachiosaurus-like creature, with a brain the size of a peanut and a liking for flowers. After the show, those children who so desired were encouraged to meet the puppets close up. Thank you to Dinosaur Zoo and all the helpers for a wonderful and memorable morning! Parents will be delighted to hear that every single child behaved really well, which bodes well for our Summer trip! Willow children meet the baby dinosaur puppets. The carnivore was so scary! Willow Class prepare for their Dinosaur class assembly. Today we had a special Dinosaur Day! 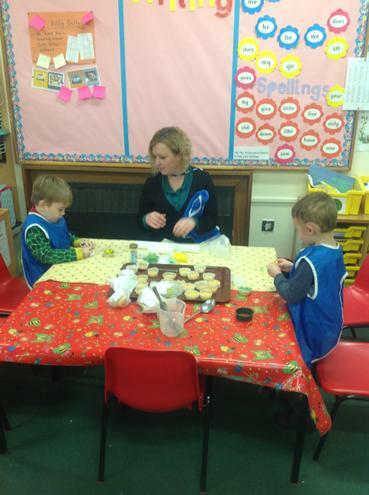 We came to school dressed in dinosaur costumes, and enjoyed a multitude of dinosaur activities, including painting a stegosaurus, baking and decorating cakes, and playing interactive games on the laptops and iPads. RAAAAAHHHH!! !